Devil’s Claw, Harpagophytum procumbens, is native to Africa, and gets its name from the pointy hooks which surround its fruit (UMMC). Devil’s Claw has also been called Grapple Plant, and Wood Spider (Sloan-Kettering). Devil’s Claw is available as a whole root, capsule, tablet, liquid extract, ointment, or tea (UMMC). The root of Devil’s Claw contains Iridoid Glycosides, including Harpagoside has pain relieving and anti-inflammatory activity. As a result, it has been used in individuals with Osteoarthritis, as well as Neck and Back Pain. Devil’s Claw contains Iridoid Glycosides, such as Harpagoside which has pain relieving and anti-inflammatory activity. This gives it indications for use in individuals with Osteoarthritis. In a study conducted, Devil’s Claw reduced pain, as well as improved mobility in 75 individuals with Osteoarthritis of either the hip or knee (Wegener, and Lupke 1165-1172). In another study conducted, 122 patients with either Hip or Knee Osteoarthritis who were given Devil’s Claw reported reduced pain comparable with to the Osteoarthritis medication, Diacerhein. Participants who received Devil’s Claw also needed to use fewer analgesics and non-steroidal anti-inflammatory drugs (Leblan, Chantre, and Fournie 462-467). Similar outcomes were observed in individuals with Back Pain. In a study conducted, 117 out of 130 participants with Back Pain who received Devil’s Claw Extract over 2 months experienced less pain and improved mobility (Laudahn, and Walper 621-624). While more research still needs to be done, Devil’s Claw seems as if it can be used to improve the lifestyle of individuals who are debilitated by pain. Side effects of Devil’s Claw include diarrhea, upset stomach, and bradycardia (Sloan-Kettering). Devil’s Claw is contraindicated in individuals with ulcers and gallstones, as well as women who are pregnant or nursing. 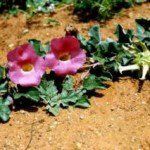 Devil’s Claw should not be used with anticoagulants, since it can increase the risk of bleeding. It may also lower blood sugar levels, so it should not be used with diabetes medications. Lastly, Devil’s Claw increases the amount of acid in the stomach, so it might decrease the effects of antacids (UMMC). Ehrlich, Steven, NMD. “Devil’s Claw.” University of Maryland Medical Center. N.p., 2 Jan 2011. Web. 5 Jul 2012. “Devil’s Claw.” Memorial Sloan-Kettering Cancer Center. N.p., 17 Feb 2011. Web. 5 Jul 2012. Laudahn, D, and A Walper. “Efficacy and tolerance of Harpagophytum extract LI 174 in patients with chronic non-radicular back pain..” Phytotherapy Research. 15.7 (2001): 621-624. Web. 5 Jul. 2012. Leblan, D, P Chantre, and B Fournie. “Harpagophytum procumbens in the treatment of knee and hip osteoarthritis. Four-month results of a prospective, multicenter, double-blind trial versus diacerhein..” Joint, Bone, Spine. 67.5 (2000): 462-467. Web. 5 Jul. 2012. Wegener, T, and NP Lupke. “Treatment of patients with arthrosis of hip or knee with an aqueous extract of devil’s claw (Harpagophytum procumbens DC. )..” Phytotherapy Research. 17.10 (2003): 1165-1172. Web. 5 Jul. 2012.